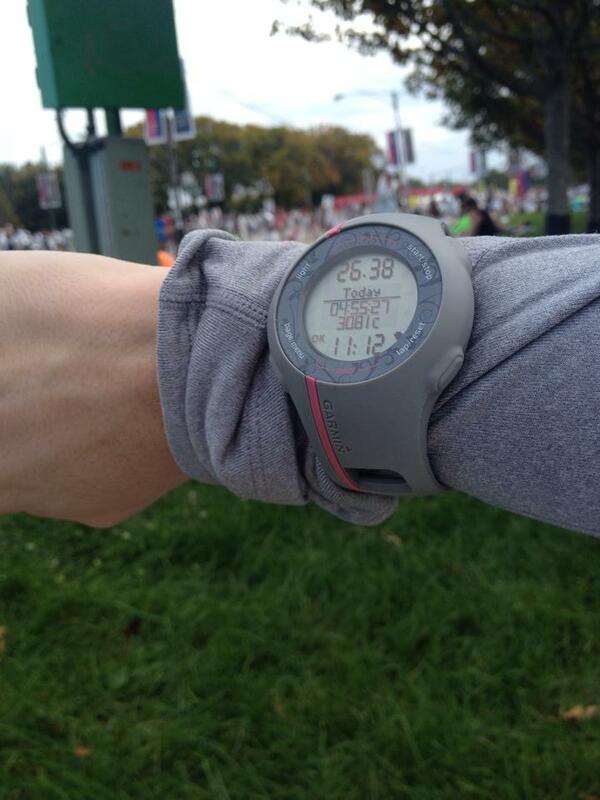 Recapping a race like the Chicago Marathon is like starting to train for one: I don’t know where to start. The beginning, obviously, but with a race like this, it’s moments of painful bursts of speed and hours on carefully-paced long runs, extra hours of sleep and accumulated minutes spent preparing recovery and fueling meals, it’s fleeting seconds spent thinking about how you can apply a new technique to your training. It’s dollars spent on new shoes, airline tickets, hotel rooms, victory meals, and all the logistics of getting out of your comfort zone and on a plane to the 3rd largest city in the country where the starting line in somewhere in the maze of streets that you’re soon going to run on. It’s all of those things that come down to a span of 2 hours for few, 3-5 hours for some, and 6-7 hours for a few more but the same distance for us all: 26.2 miles. To run a marathon is to witness the human existence, and I think that was what this race was all about for me. I’ve never really felt it before now– that sense that you are really part of something great. But you look up and you see thousands of people in every color of the rainbow, bobbing along in a run and it’s all just like….wow. I am here. Welcome to your life, welcome to existence. This is my world. Truly, the weekend rushed by me, which was how I wanted it to happen. Pre-race stress, for me, wasn’t about the pain I knew I was going to experience; it was about whether I could push past it and give myself permission to run the race I wanted. Sometimes I think trusting yourself can be harder than trusting others. I had a mid-morning flight out of DCA on Friday, and I was feeling a little bit out of it all. I was really only focused on making my connection in Atlanta, grabbing a quick carbed-up lunch, and getting to Chicago Midway where I would have to figure out the train system fast in order to get downtown where I’d be staying. All of that was astoundingly easy. Traveling for a marathon has quite a few challenges, which is why I was so grateful to have gotten there two days before the race. Between hauling around my suitcase (I did not dare check it), lifting into overhead bins, dragging it down dysfunctional staircases (ahem, Midway), and rolling it over sidewalks and curbs on the way to the hotel in addition to the dehydration I got from flying and not hydrating nearly enough on a pitiful handful of sleep, I was famished. The hotel I was staying at, the Hyatt Regency, was perfectly situated on the Chicago Riverwalk but it was hard to walk to from the train station– or my GPS just chose the most inefficient way to get me there. I got there before my group did, checked my suitcase with the concierge, and decided to walk around the streets to check out what was in the area. I found a Walgreens where I stopped in and picked up some treats for carbing-up (Pop Tarts, chewy chocolate chip cookies, and Pringles) and headed off down Michigan Avenue, about a block from my hotel. I walked far enough and found the Niketown Chicago store and stopped in for a few minutes to check out some of the merchandise. The store was a total party; absolute marathon madness. 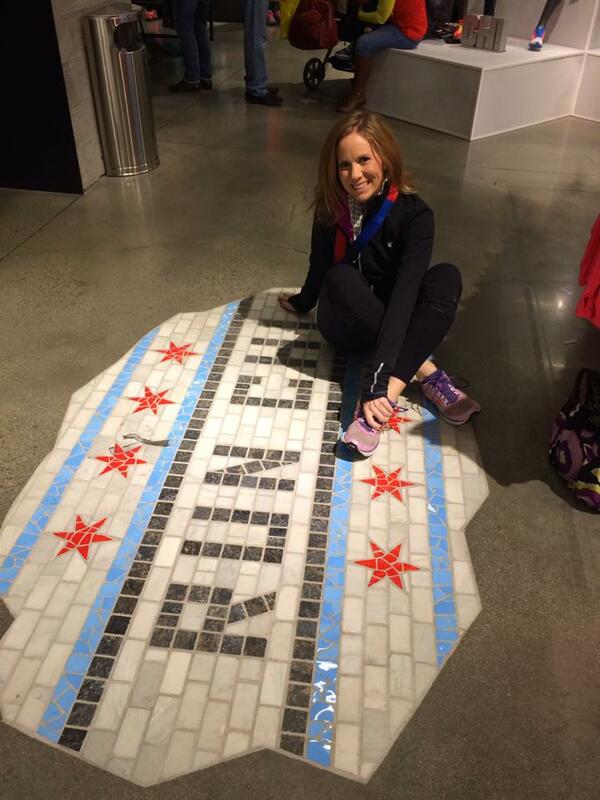 There were runners everywhere, grabbing up race gear and taking photos with some of the #OwnChicago signs that decorated the store. The energy was palpable, perpetuated in part by the Niketown store staff who had their own DJ booth set up and would stop for an impromptu flash mob. It was definitely exciting, but I was feeling a little drained by the atmosphere after a day of traveling. I really just wanted to get off my feet, so I went back to the hotel and grabbed a glass of wine. Friday night in Chicago, and the hotel was also alive with people looking to knock back after a long week. I felt out of my element in a swanky hotel bar wearing travel-weary running clothes. Ugh. I’ve been to Chicago before, but never really explored it all that much. From those first couple of hours in the city, I felt slightly like I was in New York City but also had a weird sense that I was in Omaha, too. The roar of the train and the sounds of traffic gave that Big Apple feel to the city, but I felt like I was the only one rushing around. This is typical– people have told me before I have that “city walk” down pat, for which I make no apologies. 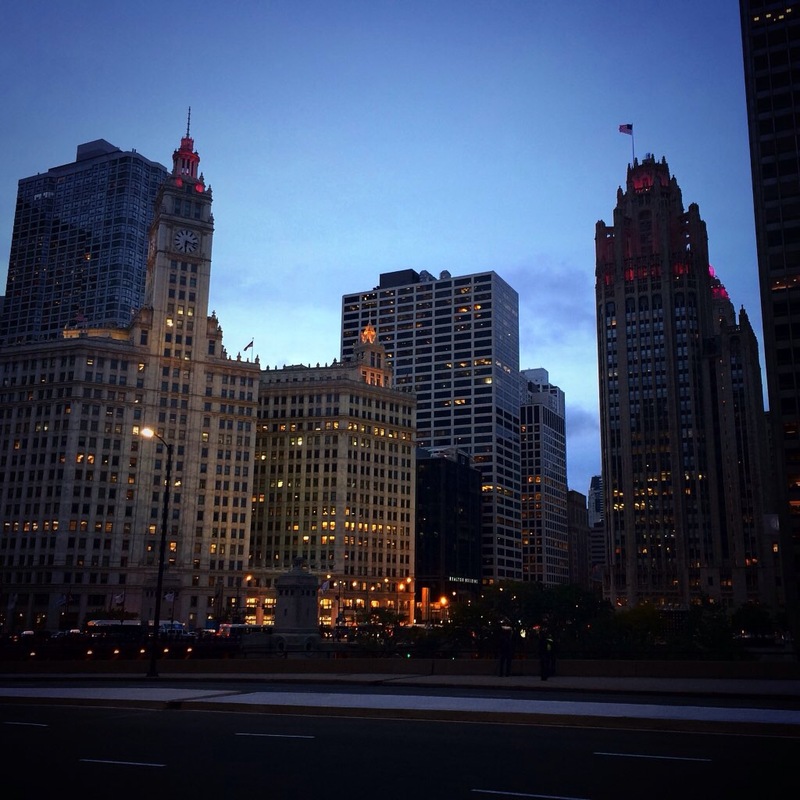 But my first impression gave me the sense that yeah, I could live in Chicago. I can handle this Big City meets Quaint Midwest feel. Only problem is, it felt pretty cold compared to Washington, DC and for being somewhere just under 60 degrees. The evening ended with the rest of my group, including my friend Jen who I was stoked to see, arriving after a few flight delays. I have to pause for a moment and say that social media really does bring people together. I met Jen (a.k.a. @jedijen) randomly at the Walt Disney World Goofy Challenge in 2013 after unwittingly asking her if my friend Telisa (who had just pointed out that Jen was wearing one of Dorothy Beal’s “I Run This Body” shirts) and I were waiting in the right spot for the bus to the expo, but I didn’t realize it was her that we were asking until, after she followed me on Instagram and ordered a scarf that I was crocheting to raise money for the 2013 Disneyland Dumbo Dare and we decided to meet up in Disneyland so I could give her the scarf, I put two and two together and asked, “So, just out of curiosity, do you remember two girls asking you at the Goofy Challenge if we were in the right place for the expo bus? Was that you?” and she confirmed that it was. A very weird turn of events that led us to becoming friends, but I’ve been able to count on her for running woes and even a few life dilemmas since becoming friends, and now we were both going to run the Chicago Marathon. Jen was traveling in from Oklahoma City with her Red Coyote Running friend Carrie who linked us all to Lisa who drove in from East Iowa for the race. The four of us had communicated before the race and now, we were all going to split a hotel room for the race, which was perfect because the total cost per person for our entire bill was less expensive than the per-night room rate! Realizing that it was slightly strange to be rooming with strangers, linked only through our marathon aspirations but could potentially be totally creepy in other senses, we jokingly dubbed ourselves “Team Ax Murderer.” Running a marathon can be an emotional event and we each had our ups and downs throughout the weekend, but we were encouraging for each other, too. 21 hours to marathon time! Saturday morning arrived, and it was Expo Day. I love big race expos— it’s the perfect time to stock up on all the running supplies you could possibly need. But the danger in race expos is that you are tempted to stay for a long time, which means precious time on your feet when you need to be resting for the race. I was definitely only wanting to spend a max of 3 hours there– 10AM to 1PM. All I really wanted was a nice jacket with the race logo on it, something I could wear and be proud of, and I found it relatively quickly. After that, it was walking around getting more free stuff than I knew what to do with, testing new things I wasn’t tempted to impulse buy, and dodging more people than I knew could fit into a small space. For as big of a race as the Chicago Marathon, the expo was executed perfectly– a top-notch selection of merchants selling everything from Nuun to Gu to foam rollers, shoes, jackets, pace watches, books on running, medal hangers, and running clothes as well as numerous foods like Kashi, Sargento, Lifeway Kefir, Clif Bars, Power Bars, and Bear Naked granola and ton of charities. But it was seriously overwhelming, too. It was easy to get caught up in all of it, so I had to stop wandering and rest while my group continued to look around. We didn’t leave the expo until around 2:30. The introvert in me, who was in some serious need of alone time after being around so many people, plus the trace amounts of ZzzQuil I had not slept off the night before meant that I was in some serious need for down time. 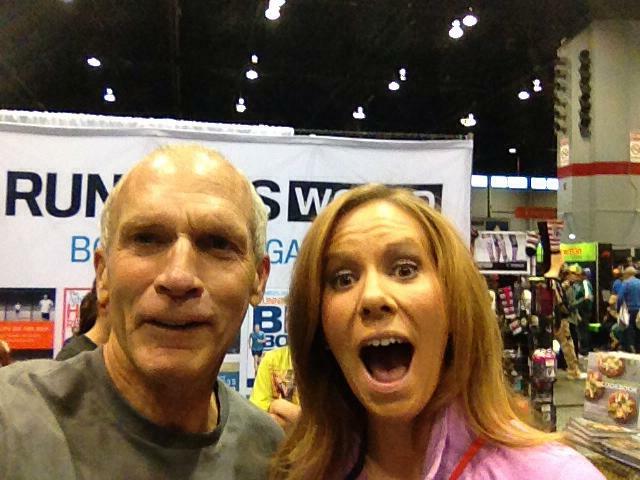 Got a #Bartie #selfie with Bart Yasso! It’s possible, too, that I was taking things way too seriously– all I could think about was the race tomorrow and how much I wanted a good run. The conventional wisdom is not to take a race as great as the Chicago Marathon so seriously so you can drink in the experience, but I couldn’t not take it seriously because I knew my training did not go very well and I was lacking the confidence that comes from feeling 100% prepared for the race. Trusting the training means more than just having a good race and meeting your race goals: it’s there so you can enjoy the experience of the marathon, too. And I just wasn’t there. I ate three plates like this. How to make friends with a runner? Give them a plate of pasta and a brownie. Following some post-expo downtime, Lisa, Jenn, Carrie, and I hopped into a cab to go across town to the Marathon Maniacs Pre-Race Pasta Party. 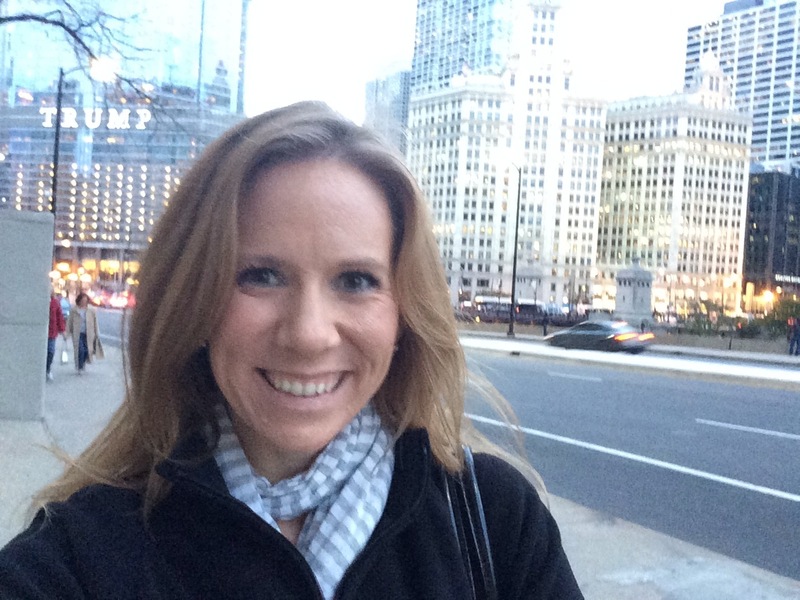 Jenn, a Marathon Maniac, was able to get us all in through her connection for two of the best things a race weekend in Chicago could offer: all you can eat free pasta with a rooftop view of Chicago. The party took place in the party room of a Marathon Maniac resident who, after having run many races in other states, wanted to give back by hosting an event at his apartment home for anyone running the race, no questions asked. Have I mentioned how welcoming the running community is!?! We all settled down with plates of pasta, and I realized then, halfway through a plate of angel hair pasta with spinach and olive oil, that I was daaaaamn hungry. All day at the expo, I’d been snacking on Pop-Tarts (I ate 4), Belvita cookies, chocolate chip cookies, and as many free samples as I could get, but I was feeling like the tank was empty. I ate 3 full plates of angel hair pasta and maybe 5 brownies as we all sat and socialized with other runners, including a runner I’d “met” through social media (@WhatThe5K). I sort of found myself wondering if running could be classified as a cult…yikes. Flat Sara is ready to go! Bedtime came relatively early that night. I wanted to be in bed by 9PM for a wakeup call at 5AM. I’d decided against ZzzQuil, trusting that my body was so tired from the expo that it would naturally fall to sleep. When it comes to sleeping the night before a big race, I am pretty strict about it for myself but this time it was even more important to me that I get enough rest because I hadn’t slept super well all week. Unfortunately, that’s not at all what I got. It took some time for everyone else to calm down and get in bed, but I was already drifting off at 9PM. I was trying to keep myself awake, however, until everyone was in bed for the night because I figured a brief doze would be the equivalent of a power nap. So, 9:15 came…9:30…I can’t sleep without total darkness, so I got up and shut off the corner lamp, closed the drapes to keep out the bright city lights, and covered the glaring bedside clock with a sock and got back into bed. Jen and Lisa were already asleep and I was just on the edge of sleep when I heard a fire truck from the station across the street respond to a call with its wailing sirens. Ughhhhhh, I thought to myself, I was RIGHT THERE. The problem was that I couldn’t stop my mind from thinking. I couldn’t calm my thoughts down and I don’t even remember thinking anything coherent. My mind was just…..racing. About what, you ask? A lot of stuff. A lot of random stuff. Things I couldn’t even bore myself to sleep thinking about. And anyone who has experienced the torture that is insomnia knows that it’s a vicious cycle. Usually, when I’m at home and I can’t sleep, I get up and walk to the fridge for a glass of water or I crochet for a little bit, but I was in a room with 3 other people who were all snoozing soundly away, so my options were limited. I got out my Kindle and played Solitaire. When that didn’t work, I listened to a bedtime playlist I made for myself. When that didn’t work, I downloaded a sleep machine app that plays various sounds. When that STILL didn’t work, I got out of bed, grabbed my room key, and walked a few laps down the hall. I stood at a window and stared at moving traffic, trying to lull myself to sleep. 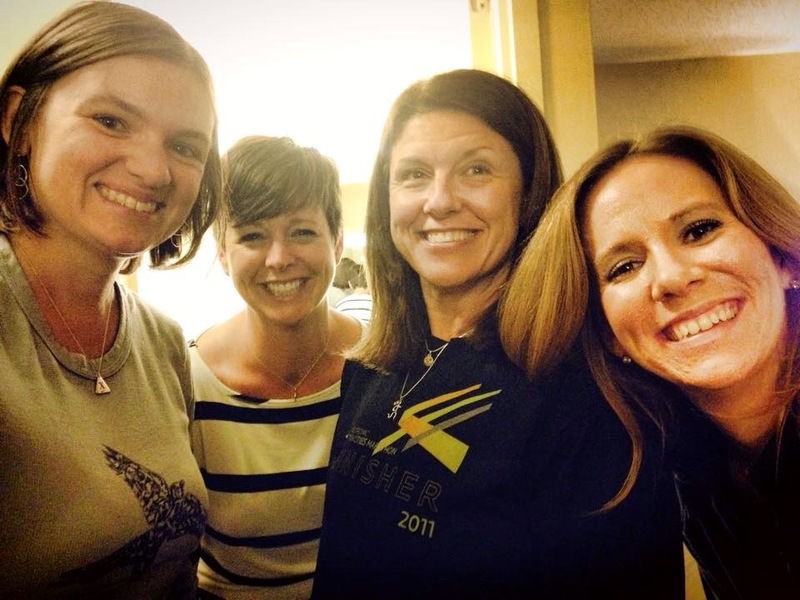 I prayed…I focused on my breathing…I tried to match my breathing to my roommates’ breathing…I did everything I could think to do but the hours ticked away and soon it was 2AM and I had been awake for 5 hours the night before a big marathon. It was unbelievably frustrating. I don’t know what finally got me to drift to sleep but I finally did around 2:30AM. The alarm clock going off three hours later was like a nightmare. Three hours of sleep is better than nothing? Not when I went to bed eight hours earlier and lay awake in desperate alertness for five hours. But I had work to do, so I prayed coffee and a quad shot of espresso would help do the trick. Surprisingly chipper for having only slept 3 hours. Lisa, Jen, Carrie, and I went downstairs shortly after 6. We were all shoving last-minute carbed-up breakfasts of Pop Tarts and bananas in our mouths and juggling our race gear. The lobby was full of other runners and the coffee line was l0ng, but fast and efficient. I gave a 50% tip to the barista for getting my quad shot out as soon as I had paid and without giving me a questioning look. I wondered if I should have asked for a double quad shot espresso. Luckily, our hotel was incredibly close to the starting line, so we got in a good calm warm -up walk to the security lines. The morning was freezing cold compared to what I was used to. I had on a fleece jacket I’d bought at Target for a colder-than-expected marching band expo last year and planned to use it as my throw-away before the start of the race, but I decided to check it. The sun coming up over the lake and casting a rosy glow on Grant Park and the city skyline was optimistic for me. Waiting in my corral, Corral F, was nerve-wracking. We were in the shade and I was starting to shiver uncontrollably. People in my corral were focused, walking around to keep their blood moving, some jumping like jackrabbits and others pacing from one end to the other with knee kicks. I held the wobbly gate for a runner who needed a long-leg stretch. I smiled nervously at the volunteer gatekeeper. I said a short prayer, choked back tears when the announcer said it was time for my wave to go. My legs were frigid and stiff from the cold but I felt focused. I was ready. Let me at it. Crossing the starting line of the race usually feels like I am embarking on an insurmountable quest of some kind; like realizing I will be a different person in 26.2 miles and I will know by then the perils of my run. Crossing the starting line of the Chicago Marathon, however, I was ready to do what I had prepared myself to do. I tried to employ my usual technique of mentally telling myself it’s “just another long run Sunday” but there was just no parallel to be had. It was race day, and my legs were about to take me on the journey they felt like taking me on that day. People in Corral F are there because they’ve trained for a 4:00-4:14 finish time. I had chosen this corral because I wanted something to obligate me to training for that time range, but right away, I could see the stark difference between the level of running I was on that day compared to everyone else. Right away, all the runners in my corral were far ahead of me and there was a moment when I was left alone on the streets of Chicago running what my Garmin had projected to be closer to a 13:00 mile. Right away, I was irritated– I had trained to run my first split in 10:53 and I had never clocked a 13:00 minute mile in my life. I felt like I was running much faster, so what on earth was going on? I knew the skyscrapers would likely interfere with the GPS on my watch, so I tried to just let it go and run, but I was annoyed. I should be up there running with the pack, I found myself thinking. I knew I had the capabilities to be running with the crowd that was already at least a city block ahead of me, not back here wondering how it was possible that I was clocking such a terrible first split that would likely have me placed in the last corral. To say the impact of it wasn’t a mental setback is a lie: I was bothered greatly. I decided that it was time to run a marathon in which I would put it all out on the line. I decided it was time to fight harder for this race than any other race I’ve run. I decided I was ready to see how far I was willing to push my own limits for pain. I wanted to walk right up to that mental and physical wall and barrel through it. It was time to fight. I pushed up the pace a little more, realizing that if I did too much within the first few miles, I would be paying a heavy interest rate later on. I knew not to go insanely fast but I was desperate to find the rhythm my legs were ready to run. Mile one was a 12:38 split (what the f*ck!?!) but mile two was a 10:45 split. 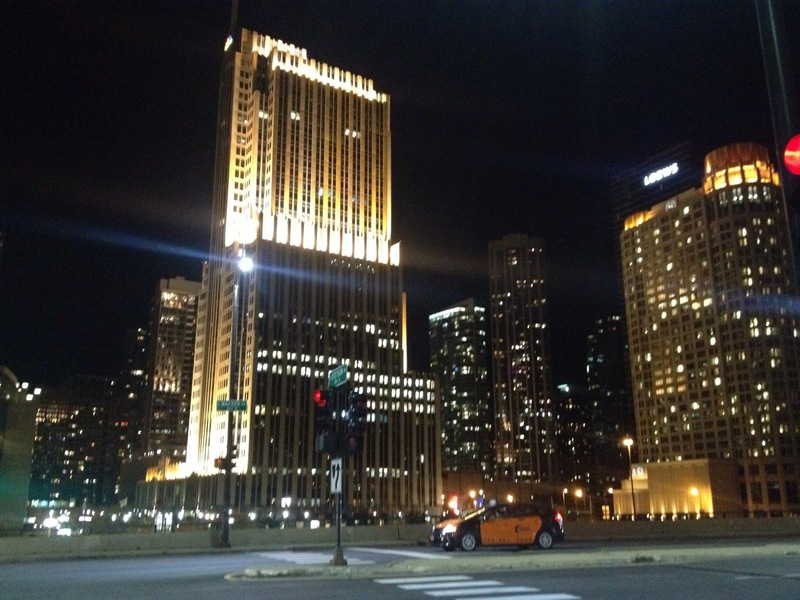 I tried to absorb where I was: you’re running through the streets of Chicago. Look where you are! Mile three was back to an 11:26 pace— I was starting to jump around. I wasn’t sure what had happened to the easy negative splits I had rehearsed so many times on the trails back home, but I was starting to feel out of control. It has to be the crowds, I thought. The crowds were relentless cheerleaders. I had scribbled my name on my legs and people were shouting my name. I hugged the left side of the course nearest the crowd. I needed their support and I wanted to take them in as I ran. At mile four, the adrenaline of the earliest crowds was starting to wane as we worked through some neighborhoods and away from downtown. A slower song came on, which I had purposely put on my playlist to remind myself to take it slow and easy, but I finished the fourth mile with a 10:42. Mile five came rapidly and I took my first Gu. This is when I found my steady rhythm and pace and decided to just run into it. Mile five was a 10:46— consistent. Mile six– twenty miles to go– came and went. 11:01. Come on, Sara, keep up the pace. Mile seven, smile for the photographer, this neighborhood is pretty. I’m actually kind of hot– 19 miles to go, am I going to overheat?? Okay, turned a corner into some shade. Where it’s super cold. Whew, okay, keeping these arm sleeves up. 10:28. Mile eight came– I could smell brunch and sort of gagged a little. The smell of bacon at mile 8 of a marathon is nauseating. Dammit, I’m exhausted…I just want to sleep. I heard the announcer proclaim Rita Jeptoo as the female winner of the race. The crowd cheered. I quickly did the math– she could run this race twice and STILL beat me on the second time in the time it takes me to run 26.2 miles. Damn, that’s fast. 10:10 split. This race is going FAST. I’m going fast! This is awesome!! Mile nine arrived so fast I couldn’t believe it. If I was on a training run, I’d be just about finished. I grabbed a handful of pretzels from a stranger’s bowl– I was starving. One more mile until Gu time. I was nervous I didn’t carb up enough, but I couldn’t think about that– my time was incredible! 10:41. At mile ten, I realized something that scared the b’Jesus out of me: my right foot toes were absolutely KILLING ME. What gives?? I thought. It felt like something was broken. Every step I took, I wondered if I was splitting the ball of my foot in two. I tried to curl my toes, which took the pain away but I could feel my glute muscles tense up in a way I was not used to. With 16 miles left, I had to just get through and see what happened. I’m sorry, guys! I thought as I sucked down a salted watermelon Gu. Dammit, that hurts. 11:04. I was losing it. Mile eleven, 10:46. I felt like I was gliding. But I needed to stop at one of the port-o-johns. BAD. Leaving the course when I felt like I was on air was harder as heck, but I waited until I crossed the halfway. Mile twelve was an 11:22 split, and I knew my half time would be posted to social media. Good time for a quick break. I jumped out of the crowds, feeling instantly like I was missing out on the party. The crowds were still going insane for all of us. I hurried up back to the race and jumped right in. Mile thirteen ended with a 12:24 split. Another pace time I had pretty much never seen except at the tail end of a race. I hope it’s those damn buildings again. Mile fourteen, I realized that a quick stop was probably just what I needed– I ended the mile with a 10:27 split. My toes were sending shock waves up my legs and I thought about stopping at the medical tent, but the thought of having to untie my shoes, peel off my compression socks, then peel them back on deterred me. That would have been at least 15 minutes off the course; forget that. I don’t care if I end up in crutches after this race; I just have to keep running. Truth be told, at this point in the race, I really don’t remember what was around me. My quads were starting to feel sore and stiff. My right foot was sending nails through my legs. The crowds were starting to wane but they never fully thinned out. Mile fifteen, I clocked a 10:51 split. I sucked down another Gu. Mile sixteen, 11:08. Mile seventeen, 11:20. My quads felt like boards. At some point, there was nothing pretty around me at all. I was starting to get tired. Wondering if I should stop and walk for a bit. Thinking I needed another bathroom break. I remembered some advice about running the marathon and decided to employ it: find a point on the distant horizon and run to it, looking only at that point and nothing else. I think this was the mile when the Willis Tower was straight ahead of us all, so I just looked at that and focused hard. I didn’t even look at the crowds. 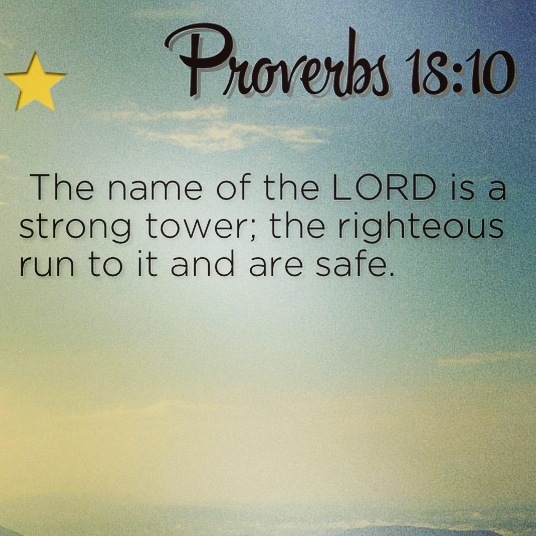 I remembered a verse that had come up on my Daily Bible Verse app at some point during my insomnia, Proverbs 18:10: “The name of the Lord is a strong tower. The righteous run to it and are safe.” For anyone who has read the conventional “how to run Chicago” advice, keeping the Willis Tower in your sight is a useful way to find how far you are away from the finish line. The parallel was uncanny. 11:21. My quads were never going to forgive me. My right foot, too. I ran to mile nineteen in 11:10, thinking about how the phone call to my mom would go: “Mom, I’m in the hospital in Chicago with a broken foot.” I concocted ways to tell my friends and co-workers the tale of how I broke the ball of my foot and why I had to be in a cast for probably 6 weeks. No 8. No, 6. Likely 10. I need Gu, I thought. I’m so damn hungry. Where is Mile 20? Mile 20 of the marathon is usually the point at which you start to lose your mind a little bit. You’ve come SO FAR. But you still have SIX MILES to go. It’s a mind game of sorts as much as it is probably the most important milestone of the race. For most of us, we’ve only trained up to 20 miles. 20 miles is the point of no return for us; you cross into the dark side at the 20th mile. The darkest hour comes before the dawn is absolutely applicable to running marathons. By this point, I was dying to walk. My quads ached terribly, my right foot was nearly numb with pain. And I was so darn sick of Gatorade I wanted to push over one of the aid tables in protest. Can’t you guys give us ANY other flavor besides lemon-line!?!?! But I focused on running from one stoplight to the next. I never saw the 20th mile marker, which meant I was past my scheduled Gu break, but that was okay because I was so hungry I could eat….well, anything that was put in front of me. Mile 20 split was 11:22. Mile 21, 11:23. A lot of people around me were walking. Not me. I pushed on. I felt like I was running fast but my splits said otherwise. Mile 22 was 11:31. I don’t care, I thought, I’m running this whole thing. I refused to look at my Garmin. I didn’t want to see how fast or slow I was going. I could start to feel the emotions welling up inside of me. Usually around Mile 22, it dawns on me that I’m actually going to finish this race. That I am going to see myself through this. 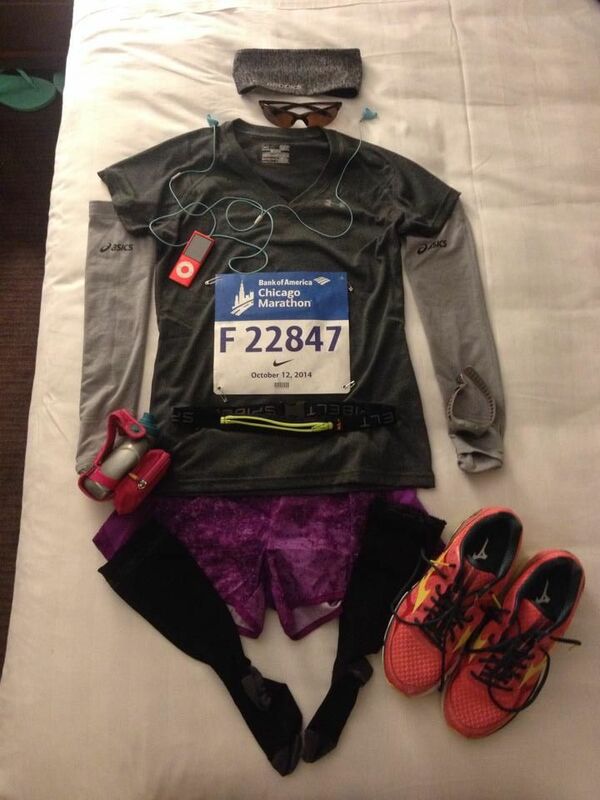 That I will be a 5-time marathoner in about an hour….an HOUR!?!?! Gahhhhh, I can’t take this. I just want to be done. Mile 23 was an 11:41 split. Seeing that now, it feels shocking– I felt like I was running harder than that. Maybe I should have looked at my Garmin, but I was focusing on running how I felt. And I just didn’t want to stop. As it happened, during Mile 23, I could start to feel the relief coming over me. I could start to feel emotions rising up in my throat. I tried to ignore them and keep running. But then I heard someone, an older white-bearded black man, shout from the crowds with such conviction, “Come on now, keep going! Don’t stop! You’re gonna make it!” I think he said my name. You’re gonna make it. He said it with SUCH passion and vigor, like he would run these last few miles for us if he could. Those four words…… you’re gonna make it. It was what I’d been refusing to let myself think for at least two miles. Immediately, the emotions broke loose from my chest and I started sobbing. I’M GONNA MAKE IT. SARA, you are GOING TO MAKE IT!!!!!! I was sobbing, making weird noises. My chest had completely tightened up and I couldn’t breathe as the sweet relief started coursing through me. No, no, no, no!!! I though frantically, don’t slow down, don’t stop! Don’t do this yet, Sara, you’ve still got 3 miles– there will be plenty of time for this! I look back on that and wish I had let myself soak it in a little more. I write this now and I can hear him say that to all of us out there on the course and I remember just how he sounded. You’re gonna make it. He didn’t even know us and he sounded so proud of all of us. It was the purest, sweetest form of encouragement I’ve ever heard in my life. You’re gonna make it. Mile 24, I was starting to feel sapped. The emotion I felt in Mile 23 had given me a wicked side stitch and I was breathing harder than I probably had in all the previous miles. I could hardly feel my quads– my legs were bent in running form. At one point, I looked down and saw my knees running while pointed outward, like my they were forming the outward corners of a leg diamond. It almost scared me– it reminded me of Sian Welch and Wendy Ingraham’s 1997 Ironman finish. Don’t look down anymore, I told myself. 11:39. Mile 25, I was back on the streets of downtown Chicago and I could feel like I was fighting hard. My whole body hurt. I wanted desperately to stop or walk, but I wouldn’t let myself. I focused hard on the streets ahead of me, thanked a band of police officers who were controlling spectators who wanted to cross, and trying to tuck my earphones in my shirt. 11:30. Mile 26, that blessed mile came, and with it the only hill on the entire Chicago Marathon course; a hill that seems as easy as a shrug on any other day but after 26 miles hurts like a beast. And dammit, it hurt. My already stiff quads were alive again and utterly fatigued. But there was no way I was going to walk up that hill after just running 26 miles. I ran up the hill, breathing hard, turned the corner and saw the finish line just 352 yards in front of me. Crossing the finish line is an emotional experience, the kind you can’t even imagine unless you’ve put in the training and work and the effort throughout the race. It comes in a blink. I was crying my eyes out as I finished– a World Marathon Majors race course– and I think I was so caught up in the moment that I kept running after I crossed the finish line. I found myself thinking Is it okay if I stop now?? I was just so resolved to run the entire time that I didn’t even realize that I had just run my first ENTIRE marathon. I could now proudly say, “The farthest I have ever run is 26.2 miles.” Almost as soon as I had registered, trained, endured, cried, yelled, given up, tried again, cheered, believed, traveled, resolved, tried, and fought, the experience was over. And I was a 5-time marathoner. I looked at my Garmin…. 4:55. I was back under the 5-hour ceiling again. I was really emotional at the finish line. In the time since the Chicago Marathon, I’ve been focusing more on my future marathon goals than reflecting on the race itself. When I think about this marathon and how it went, how my training went, and how I approached it in light of some big life changes and an injury, I have to be proud of myself. I said in the beginning that I wanted to be process-oriented and let the training take care of the goal. I was ready to meet my 4:00 time goal in Chicago, but I came in almost an hour later. Chicago still ranks as my second best marathon, right after my 4:38 PR at the March 2013 Rock ‘n Roll USA Marathon in DC and right in front of my 5:04 finish at the December 2013 Run for the Ranch Marathon in Springfield, Missouri, and it is the only marathon I have ever fully and completely run from start to finish. I can’t look at that and say, “I failed,” when that means I have just accomplished something new: I can now run for 26.2 miles. How can I possibly stop there? When I look ahead at what is in store for me, part of me wants to say “you know, I’ve had a good run at 5 marathons,” and I can be proud of that. But the other part realizes that I am simply in desperate need for a break. I realize that is the case because it kind of scares me to not be training for something right now. It’s harder not to train for something because you don’t have boxes to check off or a plan to follow: you have to trust yourself enough to work towards a goal when you don’t have an immediate one. I’m not sure what is in store for me; dreaming about marathon #6 feels so far away right now. All I can see right now is cross-training and resting and planning a trip overseas next year. It’s possible that I will run a spring marathon– I’m looking into coaching options for myself. And I am excited to run the Richmond Half-Marathon in 3 weeks– my 9th one. I’ve truly found something that is hard as hell but worth every minute. Donald Trump doesn’t #ownchicago the way I do! I don’t know how many more marathons I will do, but I don’t feel like I have anything else to prove to myself except one glaring issue. As I was walking the streets of Chicago on Monday, a World Marathon Majors finisher medal around my neck, I ran across a quote from Lauren Fleshman that truly says it all for me: “At some point you have to stop making a comeback and start running towards who you are meant to be next.” Those are words to run by. Wow! What a great race recap; you have a special way of connecting to your readers by taking us to when and where everyting happened with just enough detail to make us feel part of the action. Then, the way you put things in perspective through sharing your thoughts and feelings about how things went makes for a vibrant and colorful read. I’m sure many of us endurance athletes can relate to your experience. After I cancelled my trip at the last minute, I just wanted to disconnect from everything related to the Chicago Marathon. Then, your post shows up on my feed. Reading it was very uplifting. Thank you so much for sharing, and congratulations on a hard-earned, wonderful race. Next Next post: If Virginia is for Lovers, Count Me In!